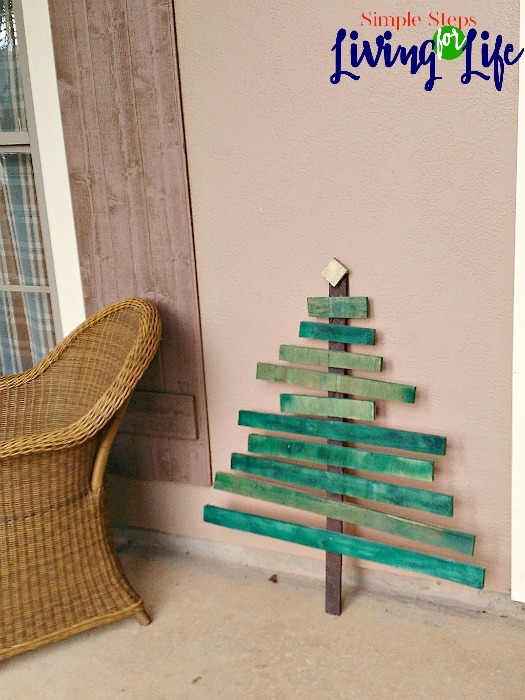 Have you seen how people have used pallets to make decorations like a Christmas tree? Well, I had some scrap wood from another project and decided to try my hand at this. 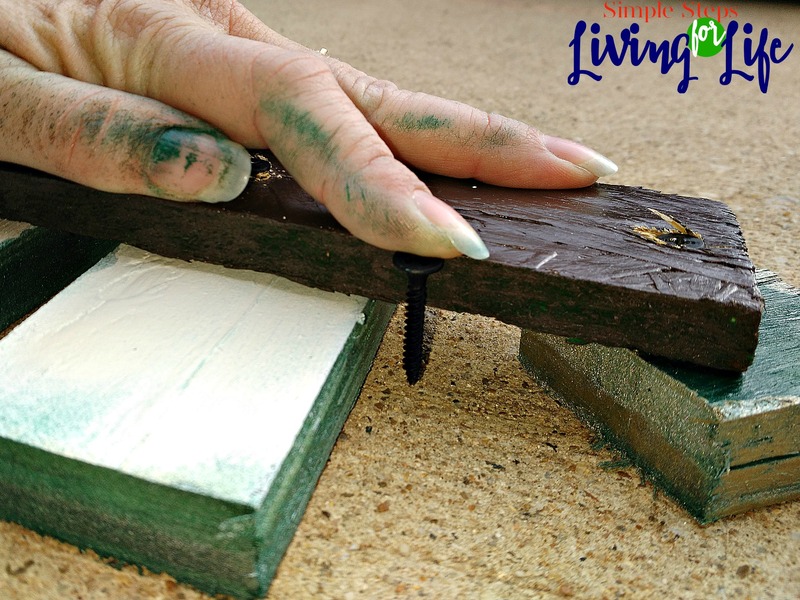 It was super easy to make and gives a little pizzazz to my front porch. 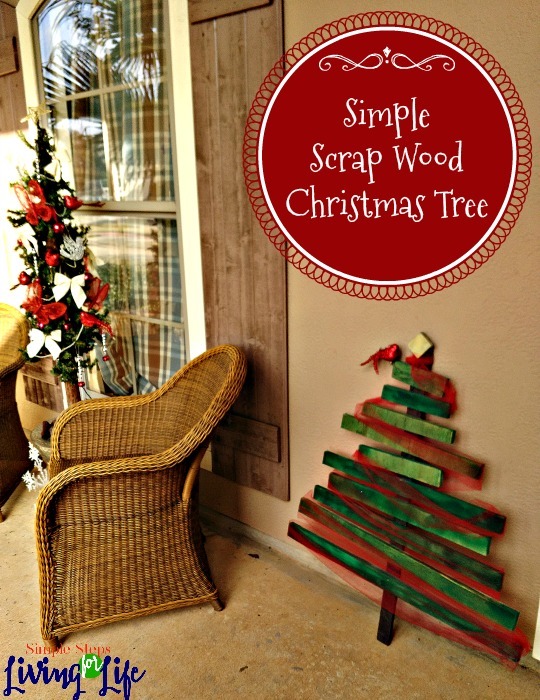 #1 Cut thin wood strips into staggering lengths to make the “Christmas tree” shape. 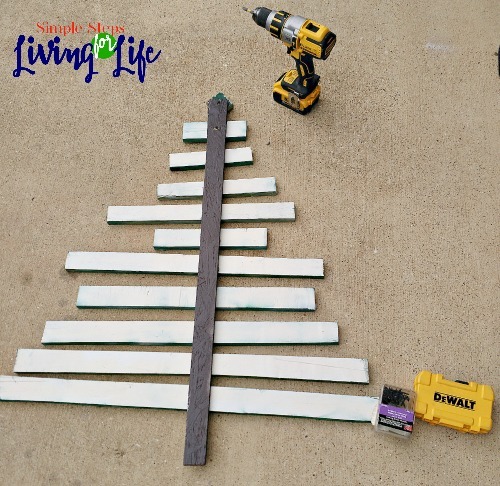 Make sure to cut one little square for the star on to and one long strip to be the trunk of the tree. #2 Paint the strips. I used two colors of green for the branches, yellow for the star, and brown for the trunk. You could get creative with this and mixed it up to match your decor. 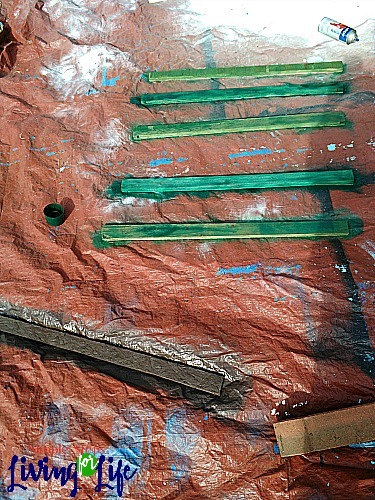 I used two colors of green because I had two half empty cans of spray paint and ran out of one in the middle of painting. I also added a clear coat of spray paint to help this stand up to the weather and hopefully last longer. 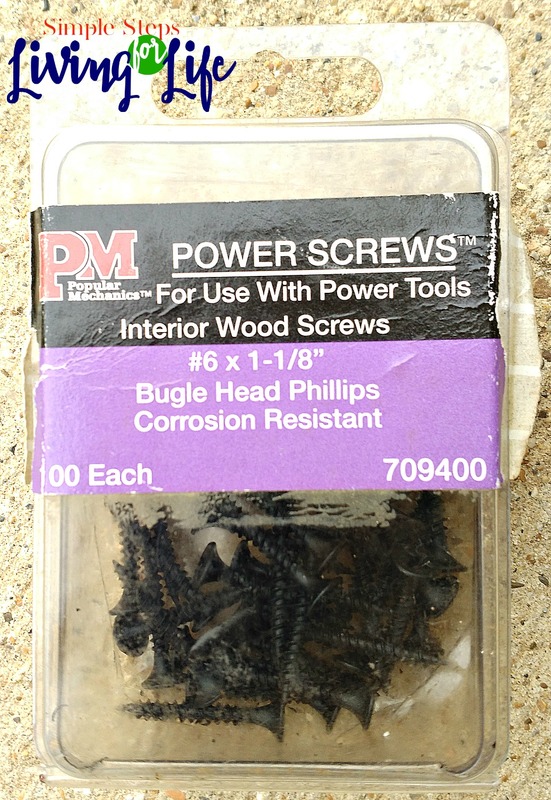 These screws were just barely not too long for the Christmas tree project. Depending on the thickness of the wood will effect which length screws you need. 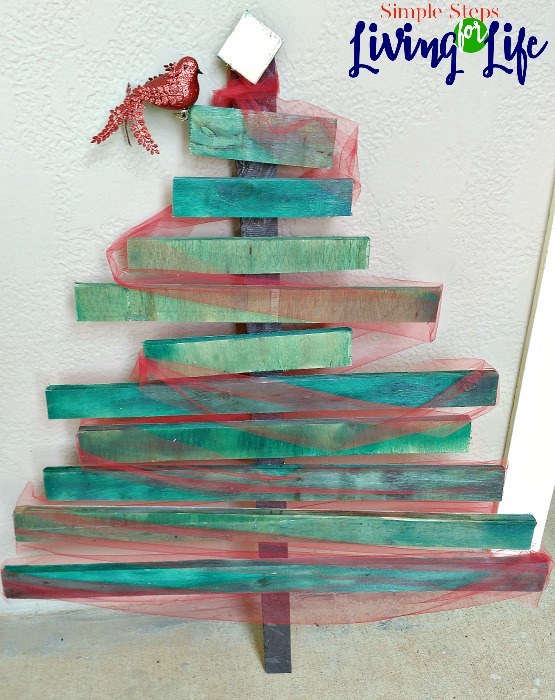 #4 Decorate your tree or leave it just as it is. Here’s a picture before I added the red tulle and little bird I found in my Christmas decor boxed… I liked it but wanted to have it match the Christmas tree on the porch. 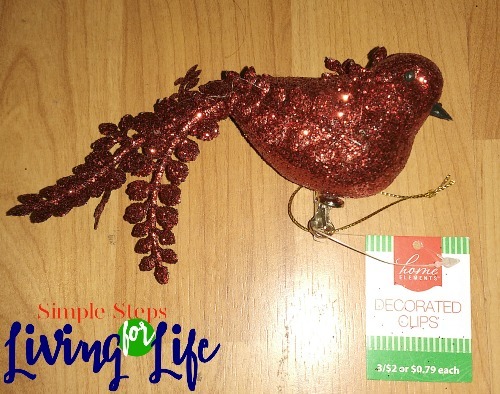 This is the little red bird I found on 90% off clearance at the end of the season last year along with all the red decorations on the tree in the picture at the beginning of this post. I added it by putting a nail at the end of the Christmas tree’s top branch and then fiddling with it until it looked just right. Tah Dah! That’s a cool idea! I never thought about using plastic bottles for a tree. FUN! First of all Merry Christmas to you. I love your idea of doing such Christmas tree. I cant believe that you have done such an amazing project with the scrap wood you have. I am doing some project of making a Christmas tree out of empty plastic bottles. What a cool idea! I’ve never thought about using empty plastic bottles. Cool!